As I’m sitting here typing this post, I am realizing how grateful I am for my hands right now. I know that might sound dumb, but let me explain why. Monday afternoon my mom was in a car accident and she broke both her wrists. She is in temporary casts until the swelling goes down and then will be put in hard casts for six weeks. The cast on her right arms goes up above her elbow and the cast on the left arm stops just below her elbow. She is helpless. She can’t do anything. . . wash or comb her hair, brush her teeth, blow her nose, dress herself, feed herself, drive, etc. What’s even more sad is the holidays are totally her thing. She loves decorating every square inch of her house and baking and making candy. Ugh!! My heart is aching for her right now. It’s sad that it takes something like this to make us realize how every single day we take so many things for granted. So today I am grateful for so many things, but especially my working, usable hands. Hang in there mom! Before I forget, I’m gearing up for my 12 Days of Sugar so starting December 1st, I’ll be sharing some kind of sweet/treat recipe to help add even more calories to your holiday season. So get your fat pats out and ready to wear. 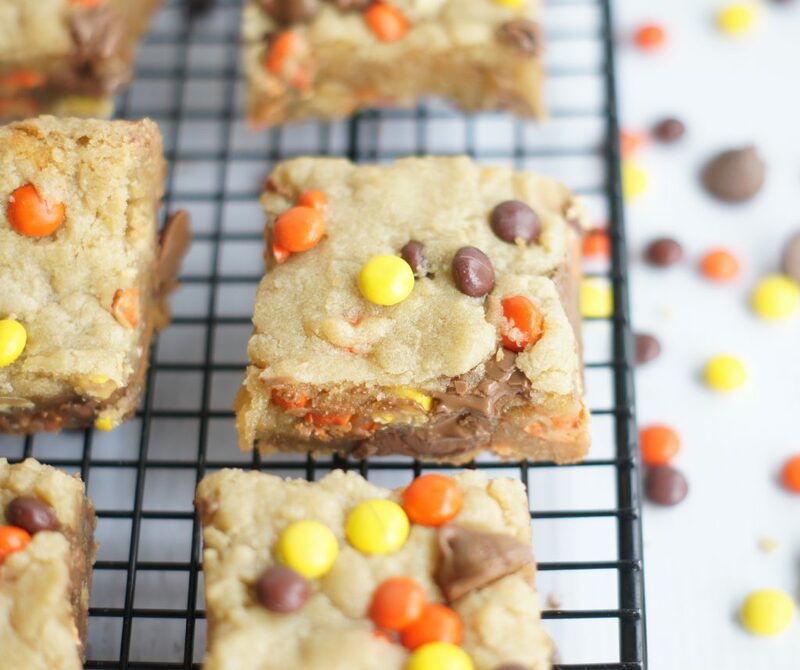 Are you a Reese’s Pieces lover? I am (surprise, surprise), so when I spied this recipe on Instagram the other day, I jumped on the chance to make them. These are so good and so simple to make. Depending on how long you cook them, they can be gooey in the center or more “well-done”. I prefer mine on the gooey side in case you couldn’t tell from the pictures. If you prefer a little bit crunchier cookie, cook them a little longer. 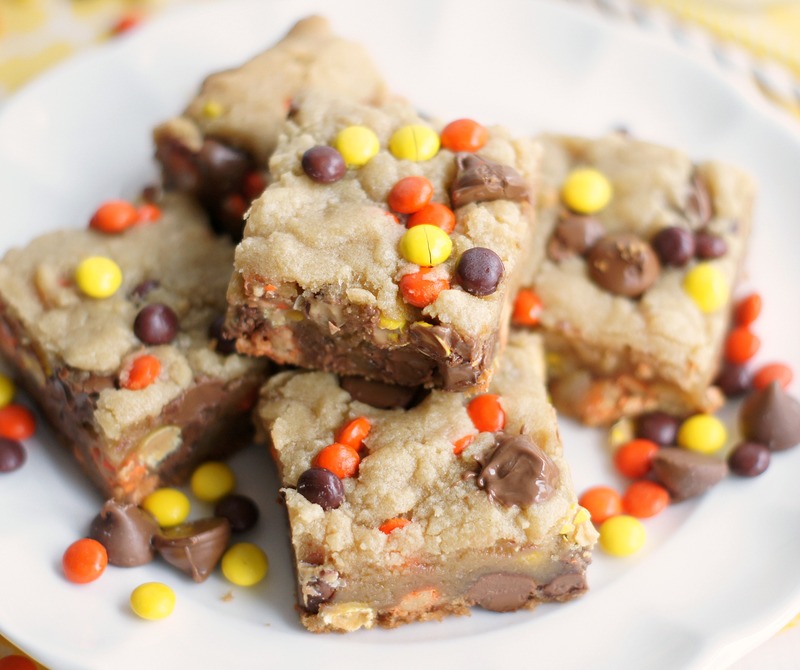 I really don’t think you can go wrong either way, I mean, come on, it’s a cookie full of Reese’s Pieces and chocolate chips, it’s bound to be good. Aren’t these calling your name? I’m pretty sure they are. Preheat oven to 325° F. Line an 8x8 pan with foil and spray lightly. In a large bowl, beat the melted butter with the sugar using a wooden spoon until mixed well. Add the egg, egg yolk, and vanilla and mix until well combined. Add flour, baking soda, and salt into the bowl and stir until just combined, the dough should look a little dry. 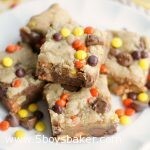 Fold in the Reese's Pieces and chocolate chips until they are just incorporated - do not over mix. Dump the dough into an 8x8-inch baking pan and lightly spread it out with your fingers. Don't press the dough down too much, just roughly set it in the pan. 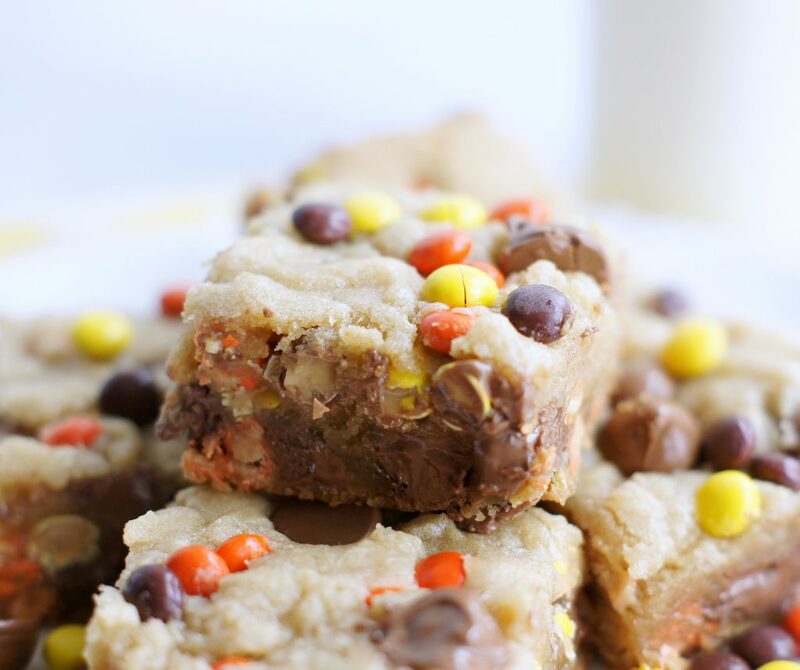 Toss a few more Reese's Pieces and chocolate chips over the top of desired. Bake for 30-40 minutes, rotating the pan halfway through the time. The bars will be done when the center no longer jiggles when the pan is gently shaken. Allow the bars to cool completely in the pan on a wire rack before cutting and serving. Bars will keep for 2-3 days in an airtight container at room temperature. Remember, all ovens are different so watch these closely. I like my bar cookies slightly underbaked in the middle so I only cooked mine 30 minutes. If you prefer your cookies more "well-done" then leave them in a few minutes longer. I am so sorry to hear the story about your mom. That is really awful, but thankfully she will be OK, just inconvenienced. We do need to appreciate our blessings! Thanks Teresa, I really appreciate that. She is hanging in there, super frustrated, but hanging in. Take care. I had an issue baking this in a glass pan. It was way undercooked then I put it back in and it over cooked. I will invest in a metal pan for then next time. Someone made these for us last weekend and they were incredible!